Orlando Bankruptcy Lawyers Do All The Work For You! Bankruptcy in Orlando can be a complicated process, and your chance of success if significantly increased if seek professional legal assistance in your filing. 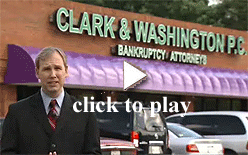 The lawyers and staff at Clark & Washington are here for you when you need us. Our sole mission is to guide you successfully through the bankruptcy process. We will not only keep you informed and educated through each step of our filing; we will also do all of the legwork for you. We like to keep things simple for our clients. You will enjoy peace of mind in knowing that your filing is in the hands of the most knowledgeable and experienced Orlando bankruptcy lawyers. Thanks to our many years of experience with Orlando bankruptcy, we know what the court needs and how they want to see it. We will prepare your bankruptcy documentation to ensure that it meets court requirements. You may be required to provide tax returns to the Orlando bankruptcy court. We know tax transcripts are often misplaced, lost and difficult to reproduce. We take the pressure off your by retrieving all your needed tax documents for you from the IRS. You may have several court hearings, depending on the complexity of your case. We have the resources to attend all court hearings. In many cases, you may not even need to be present. In order to file an Orlando bankruptcy, you are required to complete credit counseling. This can be both tedious and time-consuming. To facilitate this process, we provide the resources for you to handle this right here in the office. Unlike other Orlando bankruptcy law firms, we will not send you away to go through this very important endeavor on your own. Your paralegal will walk you through the entire process to ensure you will have no future issues with credit counseling. Having an accurate credit report is essential to your Orlando bankruptcy case. Adding creditors that were missed after the initial filing can cause you to incur additional fees. We will obtain your credit report for a one-time fee of $20 for an individual, $40 for a couple. This is not required, but we highly recommend it. Free credit reports obtained elsewhere may not be as accurate. If you are ready for Clark & Washington to work with you for a new future, call us today at 407-898-0299 to schedule your free Orlando bankruptcy consultation.